The tool-house is one of our recurrent obsessions. In very basic terms, the tool-house is a space for living and working. It is the habitat of the artisan where work and residence co-exist amicably. 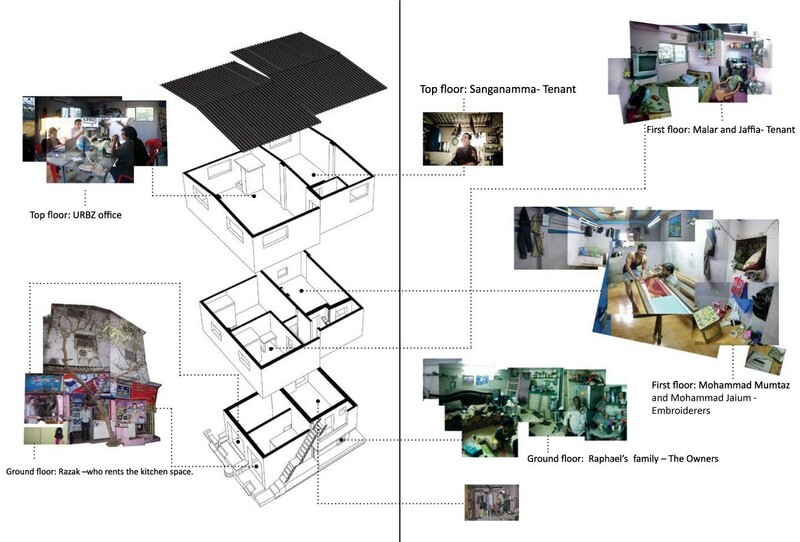 Conceptually located between Le Corbusier’s machine for living (also translated as house tool) and Ivan Illich’s convivial tool, the ‘tool house’ is an apparatus that fulfills economic and sheltering purposes. It is the dominant architectural typology of homegrown neighbourhoods such as Dharavi, and hundreds of thousands more in India and the world. Yet it would be a mistake to associate the tool-house with poverty. Quite on the contrary, it is a symbol of autonomy and entrepreneurship. Across the east and west, fashion designers, writers and doctors live and work in tool-houses. We believe that the tool-house is the most enduring artifact of pre-industrial society in contemporary times. It is also a central feature of our post-industrial world. When the industrial mills shut down in Mumbai, many disbanded workers turned to home production. Dharavi became the hub for embroidery and garments, while other centers with which Dharavi has active connections with, became sites for weaving and looms. Today this industry is not organized in large factories and assembly lines, but in hundreds of tiny workshops in as many tool-houses that are connected to each other as by swarms of agents, contractors and transporters. A fundamental characteristic of the tool-house is the way it is embedded in its environment. The street seamlessly flows in and out of it, as users come and go. It is rarely a lonely structure, but is shaped more by its relationship with the neighbourhood and the city, than by any internal force. Versatile and networked, tool-houses tend to cluster around each other to achieve an effect of scale. They come in different forms. Their evolving multiple personalities make for very useful insights into the way neighbourhoods grow incrementally. They mix and match history and biography, form and function, needs and aspirations, to produce an unpredictable template for a constantly morphing urban fabric. Here is a glimpse into the various stories that circulate in our very own tool-house. Raphael has lived in the area since 1957. During that time, the neighbourhood was all mangroves and the creek came right up to the edge of the current street. His house was given to him and his family in 1973 by the government and was one of the first housing blocks to be built in the area. Although Raphael owns the building, he and his family, in all 7 members, live in just 3 small rooms while the rest of the building is rented out. These 3 rooms have been incrementally adapted over the years to allow for the growth of his family through the marriages of his 2 sons and the birth of his grandson. Although Razak does not live in the building, he has been running his food business from a small kitchen on the ground floor for 5 years. He has seen many changes to the area, with most being improvements. 5 years ago this street was much dirtier and felt less safe. He has made changes to his kitchen during this time by adding a low, brick and cement partition between his kitchen and street, giving it a more professional, shop-like, appearance. Although he has no way to shut up his shop at night he is not worried about anything being stolen and says that it is a safe neighbourhood with strong community ties. Two of four young men live and work in one room on the middle floor of this building. Mohammad and Mohammad have been renting this room for a few months now. They used the room above, presently the URBZ office, two years ago. In the day they run an embroidery business, turning out beautiful clothes, and at night the space doubles up as a bedroom, with them folding away the intricate wooden mechanism they use to embroider. Like Razak they too feel that the area has greatly improved, even just in the last year, and that it is now a much cleaner and safer street. Malar is the young mother of Jaffia, 9, and has been living in this building for the last 6 years. Her husband is currently working in Africa so most of the time it is just the two of them. She too feels that the area has improved since she has been living here. Sanganamma’s family came to Mumbai 25 years ago. First they were in Ghatkopar and then moved to Dharavi in the early 1990s, when the place was much more basic and bare. They rented different places before settling into this house five years ago. Her husband used to work in the mills and when the mills went bust the family fell into hard times. Her most intense memory is about the 2005 floods in Mumbai when some parts of the lane were immersed waist deep in water. She remembers fondly the collective celebrations that still happen in the lane, especially of weddings, which remain a neighbourhood affair. We moved into this room two years ago. Over this time we have had windows put in, installed a toilet and have plans to change the roof (which is now made with cement-asbestos sheets, a common material in Dharavi), in the interests of both health and comfort (cement roofs tend to become terribly hot in the Indian Summer). We built tables with pallet racks and bought plastic chairs. We installed an AC and wireless Internet. It is a pretty comfortable place to work and meet. We can easily have up to 10 people together in the office (and more if we need to)!